It was really cold & sunny. It snowed a little flurry. I wore my new shoes for the first time. I ordered these shoes for myself just before Christmas. They arrived via my friend Michelle who lives in Michigan, but were too big. Sigh. This is the trouble with ordering shoes online! I shipped them back and they mailed me the correct size. I finally got to wear them for the first time yesterday. 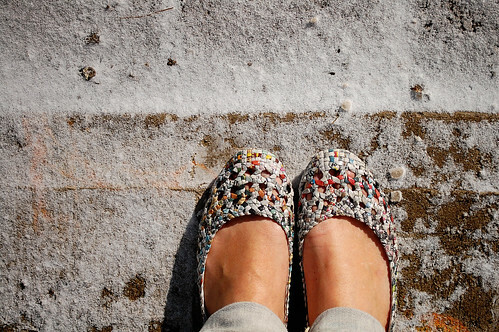 I wore them indoors only and just stepped outside for a second to snap this shot with the snow. I love them. They are made with three and half pages of newspaper folded and woven together. And they are grey. kenzie – i should have mentioned that the shoes are coated in plastic, so i hope they last a while! i just couldn’t resist them. Those are really pretty. What a neat thing! I would be tempted to display them on a shelf, I think. Oh those are so cute made of newspaper. I hope that they hold up for you how cute.